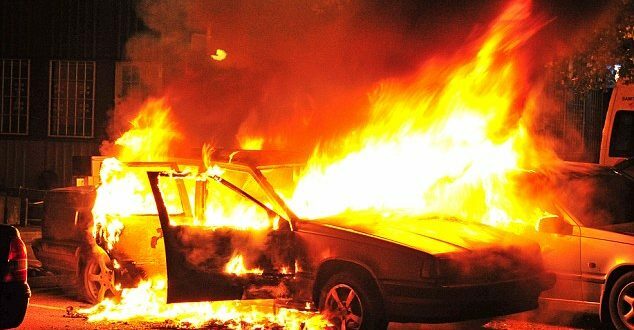 In Gothenburg, Sweden some masked youths torched dozens of cars overnight in Sweden and threw rocks at police, prompting an angry response from the prime minister, who denounced an “extremely organized” night of vandalism. Police spokesman Hans Lippens said Tuesday that initial reports indicate that about 80 cars were set ablaze overnight, chiefly in Sweden’s second largest city, Gothenburg, and nearby Trollhattan, an industrial city. In Trollhattan, northeast of Gothenburg, where at least six cars were burned, rocks were also thrown at police and roads were blocked. Gothenburg is 400 kilometers (250 miles) southwest of Stockholm. Sweden’s news agency TT said witnesses had seen “masked youngsters” running away. Two people, aged 16 and 21 and living in the Gothenburg suburb of Frolunda where some of the fires took place, were detained for questioning, police said. More suspects likely could be detained. “I am speechless. This so terrible, it’s destructive and it’s pure evil,” Jonas Ransgaard, a member of the Gothenburg City council, told local daily Gothenburg. Photos posted by Swedish tabloid Aftonbladet showed black-clad men torching cars on a parking lot near Gothenburg. Sources: Sweden’s news agency TT.